Vague rumours regarding the dimensions of Göggingen’s ground were revealed to be true as MCC arrived at the site. It turns out the ground is a baseball pitch that has been artfully repurposed for cricket. This means that the boundaries behind the wicket are extremely short, to the degree that the 30-yard circle was only charitably 30 yards at third man (with the boundary – and the batting side, with a great view from what was literally hutches – only a yard beyond it). Local rules meant that hitting the fence behind square was two runs but clearing it would constitute a very petite six runs. The wicket itself was coconut matting laid on bare hard-packet earth, something which appeared extremely village, but actually played surprisingly well – basically like a road. So much for the wicket. MCC arrived knowing we had to win to (probably) win the league. We won the toss and were glad to stick them in to bat. Their opener took the sensible option first up, trying to clear the longest boundary at cow corner off Waqas and only managing to pick out Max. Waqas continued to bowl impressively, hitting good areas at pace, and being rewarded with four wickets. (One of whom claimed to have played Bangladesh U19s, but if you believe that, you’ll believe anything!). Macca backed him up well and was unfortunate not to take any wickets, suffering two dropped catches off his bowling. With the score passing 50 and a partnership between their opener and their number 6 beginning to build, Imtiaz and Pierre were brought into the attack to keep the pressure on. This they did ably, Pierre creating several chances that did not stick. Nevertheless, Göggingen reached 90-4 at drinks and seemed set for a reasonable total. However, the drinks break allowed us to regroup and take three quick wickets after the break, Imtiaz taking two of those including the danger man, their opener, and a catch finally sticking for Pierre. Waqas and Macca were brought back to finish the innings off. However, this didn’t entirely go to plan, as Göggingen’s 9 and 10 proceeded to give us a display of horrible slogging, with them swinging so hard at so many balls that by law of probability some simply had to fly to the boundary. Macca did eventually dismiss the number 10, and Waqas was unfortunate not to end with 5 wickets as another catch went down off his last ball. With JD warming up to bowl, Pierre demanded another spell and quickly cleaned up the tail in unorthodox fashion with two caught by Varun at fly slip. 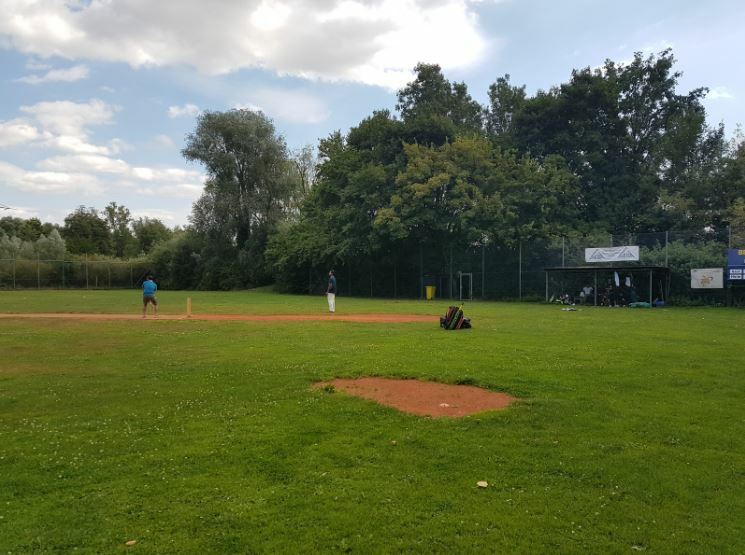 Overall, a fine performance from our seamers (in which, from memory, at least 16 chances for wickets were created) meant that Göggingen ended on 139 all out after 31.2 overs. Our openers, Wembo and Mudi, opened in assured manner against a pair of left armers. One of them had a bit of pace but had a strange obsession with bowling the bouncer (a tad unwise when the third man boundary is 20 yards). It is hard to escape the conclusion that Germany would have a fine battery of pacemen with a bit of coaching, but at grassroots level that coaching is sadly lacking! Regardless, it was nice to see some pace – Wembo and Mudi particularly enjoying it, their partnership quickly bringing us to 64, with Mudi smashing four sixes (well, two were guided over third man, but anyway) before falling for 30 on the boundary while trying for another. With Wembo anchoring the innings (despite evident frustration at several times creaming the ball through point and hitting the very last part of the fence denoting “two runs”), Macca stuck around for 13, taking the overall score to 100 and effectively breaking the back of the chase. Maxi then came and went cheaply, but JD and Wembo looked like they would comfortably see us home. However, Wembo fell on 48 (with just 5 runs needed) to a good delivery that nipped away, leaving him disappointed at missing out on the half century – nevertheless, it was a fine innings. 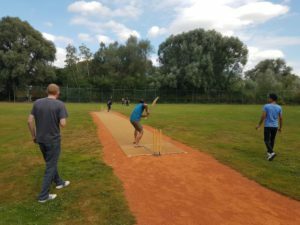 Despite Varun trying his best to hole out to long on, we quickly made the final runs with no further wickets lost. 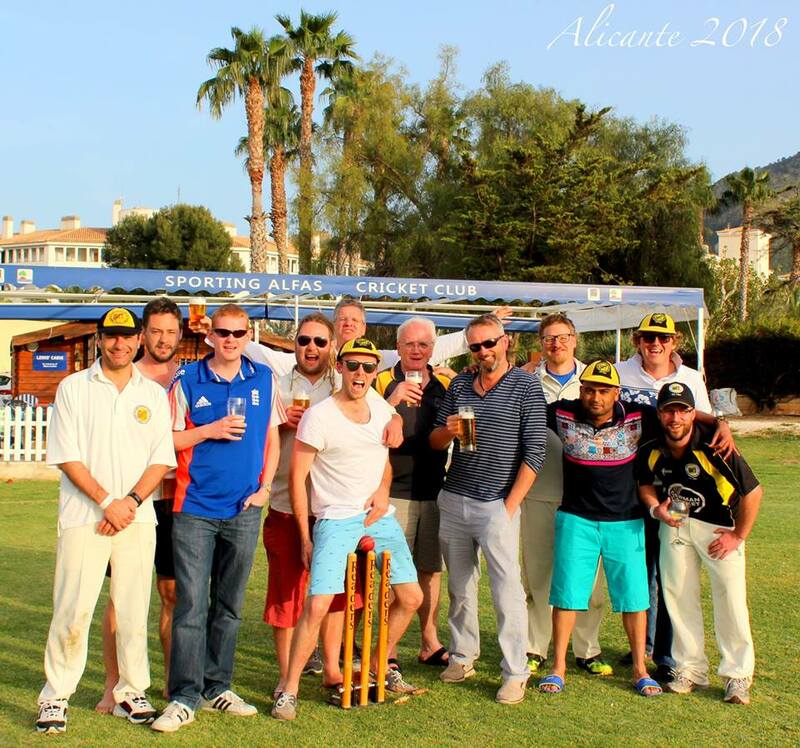 After a fine team performance, we made our way back to the Hirsch to see the end of the tour match (proper cricket, with whites and red balls!). 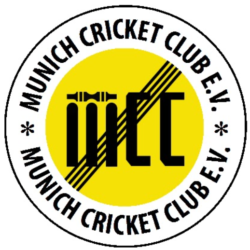 The beer suddenly tasted all that much better when the news filtered through that CCB had lost to Würmtal, making MCC the Regionalliga Süd [or whatever it is] champions! As we contemplated the prospect of Bundesliga next year and reflected on a season of fine team and individual performances, there was beer and trips to the Eisbach aplenty.